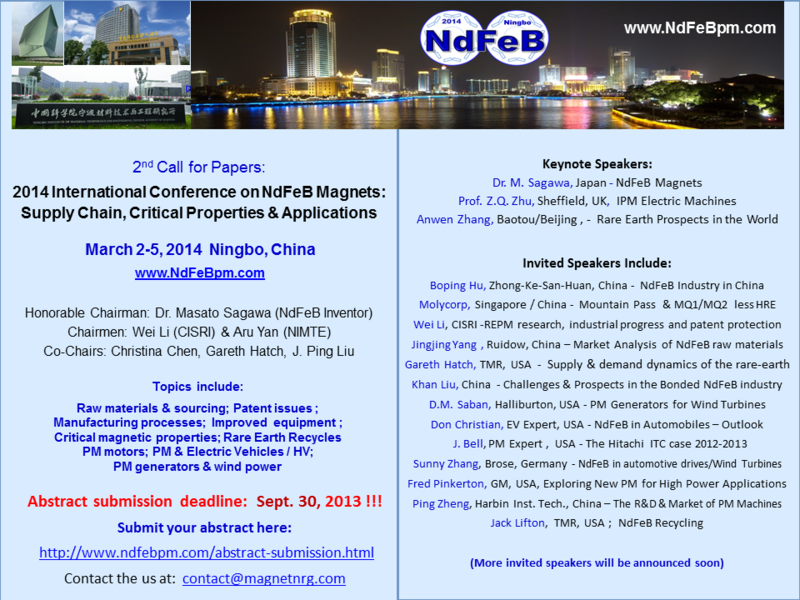 We are pleased to invite you to submit your papers to 2014 International Conference on NdFeB Magnets: Supply Chain, Critical Properties & Applications, which will be held on March 2-5, 2014 in Ningbo, China. Please read the details at http://www.ndfebpm.com/ . The deadline for Abstract Submission is Sept. 30, 2013. Please read the 2nd Call for Papers at: http://www.ndfebpm.com/2nd-call-for-paper.html. This conference will provide a forum for exchanging the information of challenges and prospects in rare earth supply chain, the NdFeB industry, and the PM motors/ PM generators. The NdFeB Inventor Dr. Sagawa is the Honorable Chairman of the conference and a Keynote Speaker, who will deliver a speech about the new development of NdFeB. Prof. Z.Q. Zhu, who is the Head of Electrical Machines Group from University of Sheffield, UK will give another Keynote Speech on the NdFeB applications in EV & wind power. The former President of Baotou Rare Earth Institute, current Deputy Secretary-General of Chinese Rare Earth Society Prof. Anwen Zhang will deliver a Keynote Speech on the prospects of rare earth in China and around the world.